Tower Lifts started life in Ampthill, just 15 miles north of Luton. So we’ll always think of ourselves as a local provider, despite the fact we now work nationally and internationally. Consequently, it’s always a delight to find ourselves on ‘home turf’ providing Bedfordshire lift engineers to businesses in Luton. And, given the range of services we offer, we tend to find ourselves making the journey down the A6 fairly regularly. The Tower Lifts design and installation team have been providing customised and bespoke lifts in all these contexts for nearly two decades now. Once your lift is installed, regular lift maintenance ensures ongoing high quality performance. It also minimises the risk of lift breakdown, and costly repairs. The Tower Lifts maintenance team will tailor your maintenance schedule, according to the lift age, repairs record, usage, and model. Then we’ll inspect your installation at regular intervals, carry out running repairs, and recommend upgrades, or modernisation where necessary. Should your lift break down, Tower Lifts offers a fast and effective response. Our emergency repair team will deal effectively with passengers caught up in the incident, as well as the lift installation. Our first priority is always to ensure the safety of the device. Having done that, we’ll provide immediate repairs if at all possible. If not, the lift engineer will keep you updated the earliest opportunity to get your lift up and running again. Older lifts can be given a new lease of life with a carefully scheduled programme of refurbishment. It’s a process of renewing a lift in situ. Our lift engineers can plan a refurbishment to make your lift DDA, or safety compliant. Alternatively, you may wish to give a tired-looking lift a facelift. We often carry out aesthetic refurbishments on the passenger cabin, lift doors, or frontage. The leading trainer and sports retailer, JD Sports, asked us to help with a logistical problem they were experiencing. They needed to find a way to get products from their store-room onto the shop floor without taking their customer-facing staff out of the store. Our lift engineer in Luton suggested using a dumbwaiter lift as the solution. This small goods lift, found in most restaurants and hotels, proved an ideal way to solve the problem. We have now installed dumbwaiters in JD Sports stores across the UK. 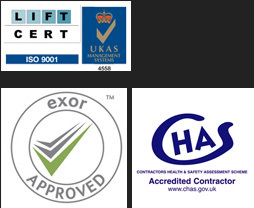 Tower Lifts is a leading UK provider of lift products and services. If you’re looking for a local lift engineer in Luton, call 01525 601099 for local Bedfordshire expertise.